Those who did not read my article on Sandisk MP3 player on http://zlgr.multiply.com/journal/item/37 and its noise isolating earphones , here is a short description of these wonderful ones. 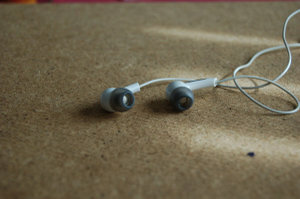 As you may notice in the photo these ear buds use a smaller then the standard earphones micro-speaker and use a plastic thin foiled ear like external isolator , that makes the earbuds ‘plug’ into the ear. Αναρτήθηκε από Zach Liang στις 1:08 π.μ.